While most people have cats, dogs or birds as pets, Joao Pereira de Souza, 71, of Brazil, has a penguin pet of sorts, according to the Wall Street Journal. In 2011, Pereira de Souza found JinJin, a Magellanic penguin lying on a beach covered in oil near Rio de Janeiro. He took the bird home, cleaned it up, fed it, and gave it a place to recover, according to the Independent. While this type of penguin is usually a cold water bird, it is not unusual for them to find their way to warmer waters, what is unusual is that JinJin keeps returning, according to the Independent. "... he stayed with me for 11 months and then just after he changed is coat with new feathers he disappeared ... Everyone said he wouldn't return but he has been coming back to visit me for the past four years. He arrives in June and leaves to go home in February, and every year he becomes more affectionate as he appears even happier to see me," Pereira de Souza told the Independent. JinJin wags his tail and honks when he sees Pereira de Souza. The penguin also gets territorial if other animals try to approach Pereira de Souza, according to a video by the Wall Street Journal. 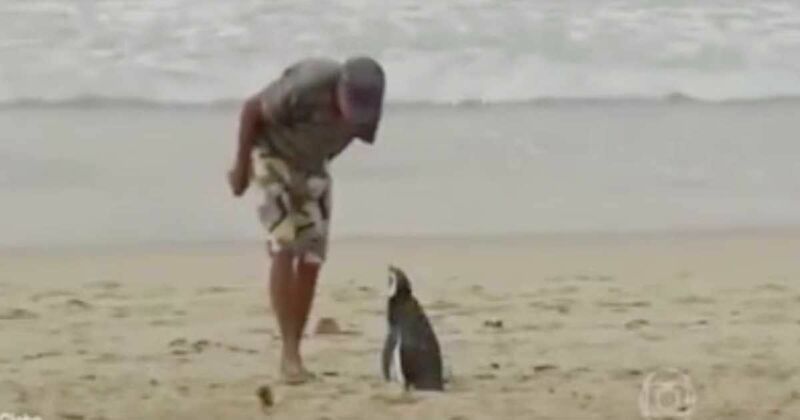 Although it's technically illegal for anyone to keep a penguin as a pet in Brazil, authorities have let these two alone because of his help in rescuing the penguin, according to the Independent. Check out more of their heartwarming story in the video below. We want a kangaroo cuddle! Baby goats are awesome! It's as if someone put springs inside of them and turned them on to give the energizer bunny a run for his money! Watch and see. A mama black bear in New Hampshire had her hands full trying to get her four cubs to cross the road. It soon became apparent that one of the cubs was in trouble. The staff was enraptured at what was happening on the other side of the glass. Cate had six adorable kittens. These superheroes sporting dog leotards are leaping in to conquer dog hair everywhere!